In the spirit of community partnership, Tallulah Falls School hosted a special event for the town of Tallulah Falls on Feb. 5. 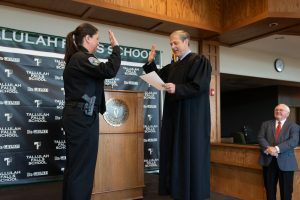 The late afternoon reception to honor Tonya Elrod, the newly appointed chief of police for the town also served as an occasion to hold a ceremonial swearing-in. Tallulah Falls Mayor Teri Dobbs introduced Elrod before inviting Mountain Judicial Circuit Superior Court Judge Chan Caudell to administer the oath to Elrod.